This time a year ago I was deep in the parenting trenches. Our youngest was a newborn and on top of sleep deprivation and what felt like constant feeding, I was trying to keep our three and four year old boys entertained (and not trying to strangle each other!) PLUS keep the house tidy – ha! It was after a particularly bad day when I was stuck to the couch feeding bub and watched as the two older boys pulled out EVERY SINGLE toy that they owned and started fighting each other over whatever toy the other one had, that I decided enough was enough and start putting together our toy rotation system. That night after they were all in bed (which was super early as I was OVER it!) I stormed through the house picking up all of their toys, books, blocks etc that they had strewn around and popped them all into tubs and put them into our linen cupboard. Not only was it kind of therapeutic picking everything up, but it was a great opportunity to throw out those toys that were broken, missing pieces and also donate toys which they no longer played with and had simply pulled them off shelves etc for the fun of it. The boys now choose what they want to play with from our ‘toy cupboard’ aka the linen cupboard and they need to pack away what they have been playing with before getting something else out – unless it’s to continue with whatever they are doing of course. I have divided their toys across three plastic tubs, each tub contains a mixture of cars, trucks, toy animals/dinosaurs etc which encourages them to get creative. I also have three dedicated containers for their craft supplies, paper and drawing materials and another for things like play dough, beads etc which I need to keep a close on eye while they are doing to make sure bub doesn’t try and ‘eat’ any of it. They keep their ‘special’ toys (things like their DinoTrucks, Transformers etc) and books in their rooms and grab them whenever they like. We also keep their tubs of Lego and wooden train sets upstairs to keep it contained to one area which is especially important with a 15 month old who puts EVERYTHING into his mouth. 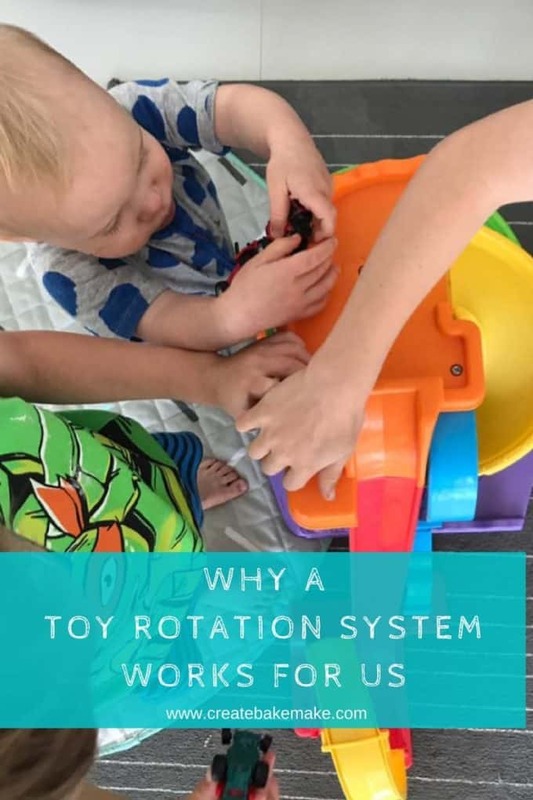 Our toy rotation system has been working well for over a year now and while I completely understand it’s not for everyone, it works for our family. I was a little concerned initially that it may hamper the boys impulsiveness and creativity when it comes to play, however it has actually had the opposite effect. Instead of losing interest in things as soon as they spy another toy, they now play for longer and play better together (don’t worry they do still fight all of the time) and come up with some amazing play scenarios and adventures. They also love ‘discovering’ new toys/play sets that they haven’t used in a little while and it’s honestly like Christmas for them when they re-discover a toy that they had gotten ‘bored’ of a little whole ago. It’s also had the added bonus of helping me feel a little bit more organised when it comes to life around the house. Do you use a toy rotation system in your house? How do you keep your kids toys organised?